THUMP: a standalone mod for Tesseract. When I started playing Tess, I enjoyed the experience (and loved the dynamic lighting), but I thought there was one problem (that a lot of people have with the game): there was no health or ammo. THUMP's M.O. 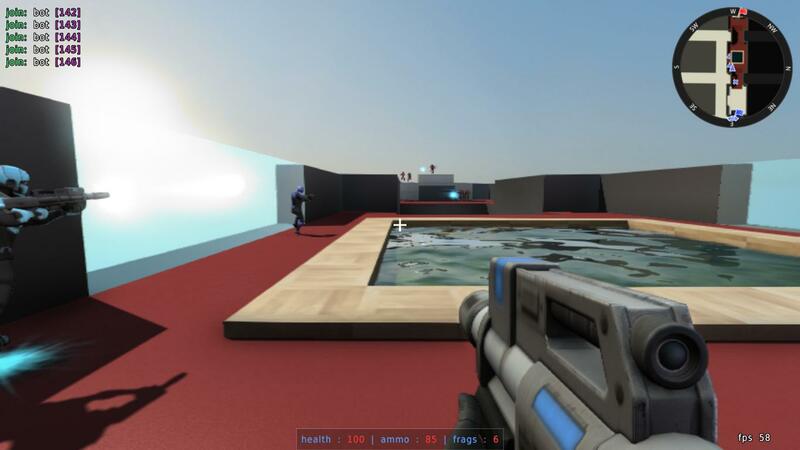 was originally to add health and ammo back into the core game experience. Since I started however I've started to add other things I like. For example, you can script HUDs in CubeScript: this is something I have wanted from the Cube engine since I started using it in 2009. There is also a new gun; a machine gun. At this moment, it uses the pulse gun model, which I did want to avoid but at the moment I haven't had the time to knock something up. There's other minor tweaks here and there. 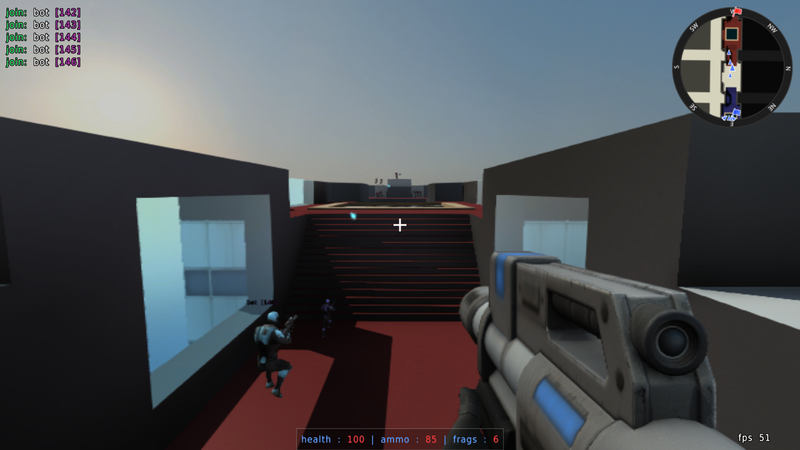 For example, a player model being in the main menu itself, randomly selected backgrounds, a prefab gallery, a music selection menu, and a cubescript addon system. THUMP also brings new maps and textures; at the moment there are five new maps (microcosm and skytowers by me, acidic by wizard, and otoverhaul by drag(ing)on and unnamed), and I added Robin's CC4 textures. THUMP is no longer in active development, however I am doing some new projects with the Tesseract engine. I have set up a new username called bullpizzle -- in reflection with my internetwide name change -- to do more stuff! It looks the same as vanilla Tesseract. I have errors on compiling, Linux Mint Cinnimon 64 bit. Must be a problem with TDMGCC recognising this, but your compiler not. I've just commented out the areas where there is a problem, and making sure texname will only be bg_0.png - it's annoying, but I would rather get the important things (health/ammo, misc. cubescript binds) working as opposed to minor tweaks. Currently, it does. It's more of "Tesseract with health, ammo, a cubescript HUD and more maps" at the moment. It is a tad embarassing. I'm fixing it now. Will commit on GH later on. As you can see from the title above, THUMP 1.0 has been released. Here are some more images. The Windows setup has been made, and I'm compiling the Linux binaries tonight. I'm having difficulties getting Ubuntu to work at this time. Binaries will be out ASAP. I'll be testing this game really soon and come back afterwards. Well, I've played the game for a while. All I can say is: It's Tess with Health, Ammo and HUD + Some new, simple maps. 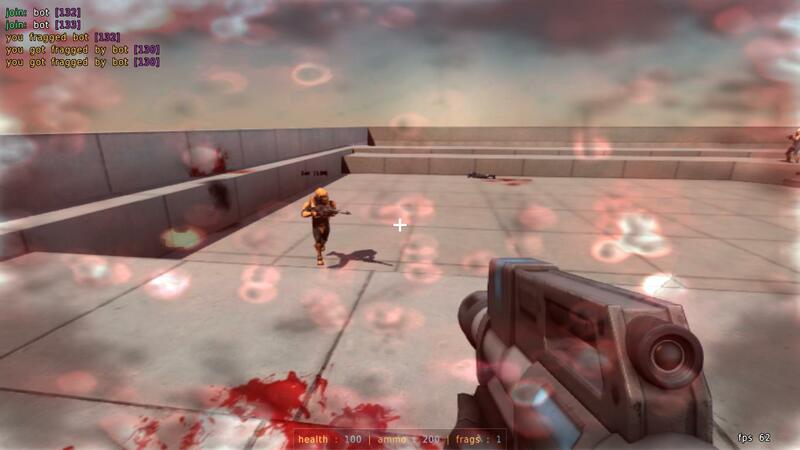 The gameplay is Tesseract-like, but since there is health and ammunition, it is closer to Sauerbraten. Sauer with Tess' assets. One thing I would ask Byron is to add Health packs to replenish health, since the game isn't an Insta-only. 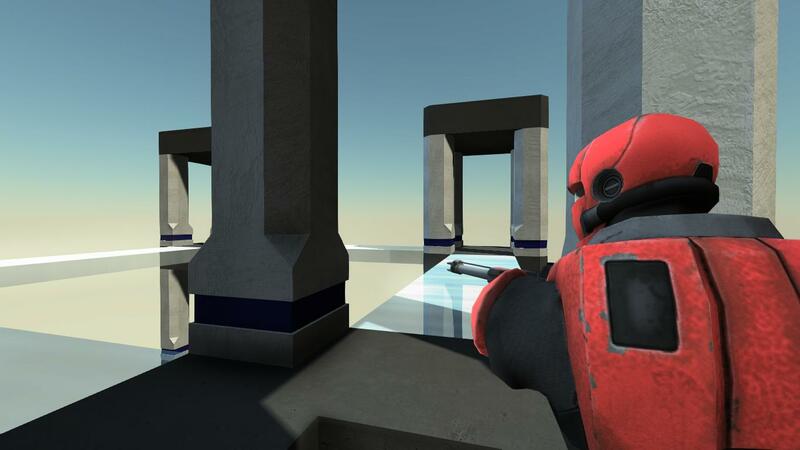 >Chaingun, which looks like the Pulse Rifle (For now that is). 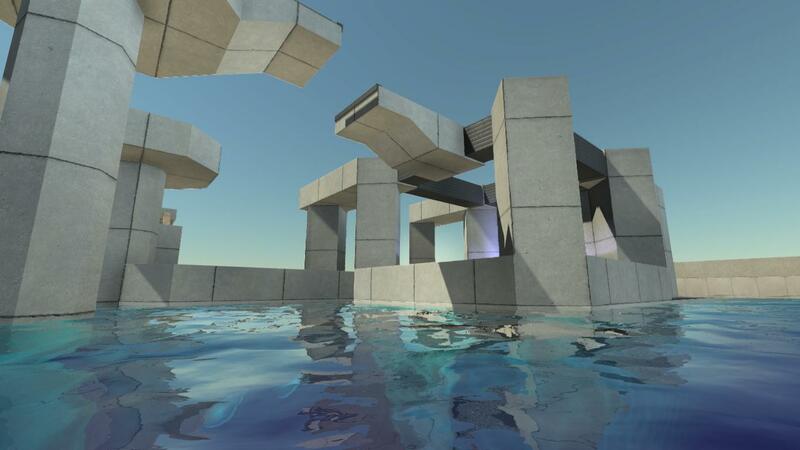 New maps have been added alongside with Tesseract maps. >Otoverhaul, which is Ot with a new design. Just like Ot (Tess version) is Ot (Sauerbraten version). I would recommend to remove the map Ot, since Ot = Otoverhaul. For a first version, each one of them are nice but I advise to alter and change then for more fun gameplay. It's a simple mod. Keep developing and work your way to make THUMP a different game. Hopefully, in 1.1 (which *fingers crossed*, will be out at the end of the month), health and ammo pickups will be in the game. I don't see a reason for it not to work. I should also be able to make a chaingun model by the end of the month as well. I have a small update: 1.1 will definitely be out within four weeks. No chance of it not happening. Why don't you merge your modifications into the main Tesseract branch, since they are "normal" gameplay features? It would help boost the project and you wouldn't have to keep syncing the codebases. Well as i understand it, no point in complicating it. Tesseract is built on real tight and slim codebase and thats one of its strengths. This complicates the whole project plus the features aren't necessarily superior to whats in Tesseract. They are debateable. As i see changes are done slowly and thoroughly documenting every single thing down to the single pieces of code in SVN. Merging big projects together isn't really useful unless we get giant improvements to the game. I'm not saying THUMP is a bad mod. I'm saying its features are debateable whether to include or not. It's not concretely better than Tesseract. The more forks, the better. Customizable/scriptable HUD is a quite useful feature, even though Tesseract's is currently minimal. And for those who are interested, the latest code that contains health/ammo packs is on GitHub. It adds health and ammo packs. The link is here at http://github.com/almightyworld/THUMP/releases/tag/1.1 - currently versions for Windows are only available. The Linux binaries will be compiled and added to the portable release soon. Why doesn't Tesseract have this by default like Cube does? -The devs probably didn't want to release using the same content as the last 2 games, which means if the gameplay was the same, they'd have to source all that media again just for their initial release. 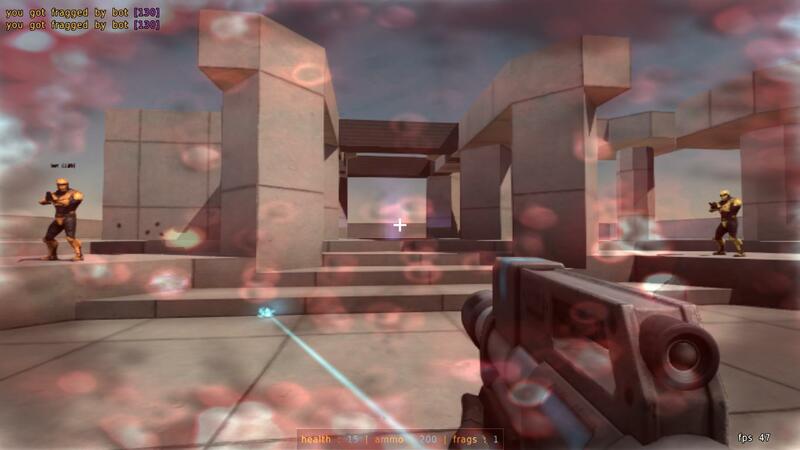 -Insta is the most popular mode in Sauerbraten atm (although effic is starting to take over), so if they wanted to narrow down the game to one mode, insta would be the most logical choice. -Tesseract seems to be mostly an expansion/rework of engine features (although there has been some refactoring/improvements on the game code as well), and having a relatively complicated game on top to maintain would be a drag to the engine work. IDK if any of this is correct, these are just some of my assumptions.